The textures of succulent sweet potatoes and crunchy wholesome broccoli contrast each other beautifully in this flavoursome vegan stew. Crushed peanuts mixed in with earthy chopped tomatoes create a thick and rich sauce, underpinned with chilli and cumin, adding a spicy kick. Serve it with a tortilla wrap for dipping and this stew makes a hearty winter dinner option to warm your cockles on these chilly wintry nights. I’m obsessed with peanuts at the moment. Any chance I get to make a nutty sauce, I’m there. Peanuts [and peanut butter] add such richness to sauces – from curry pastes to dips – and they’re a good source of vitamins too. Put a large saucepan (that you have a lid for) on a medium heat and pour in the oil. Add the onion and fry for 5-7 minutes, until it turns translucent. Sit in the cumin seeds and cook for a minute or so then tip in the sweet potato chunks and chopped chilli and stir well, cooking for a further minute. Pour in the chopped tomatoes and water, stir in with the other ingredients and pop the lid on the pan. Bring to the boil. Simmer for 10 minutes with the lid on, stirring occasionally. Meanwhile, place the coated peanuts in a food processor if you have one and blend until fine. If, like me, you don’t have a kitchen big enough for a food processor, then pour the nuts into a jug or similar container with tall sides and carefully use a hand blender. To avoid peanut shards flying everywhere (learn from my mistakes), place a tea towel around the top of the jug while blending to keep the nuts at bay. You may need to stop a couple of times through this process and give the nuts a stir to make sure you’ve blended all of them. At this point, add the nuts and the broccoli and stir in with the rest of the stew. Cook on a low heat for 10 minutes until the sauce has thickened. Season well and serve in large bowls with warm tortilla wraps. 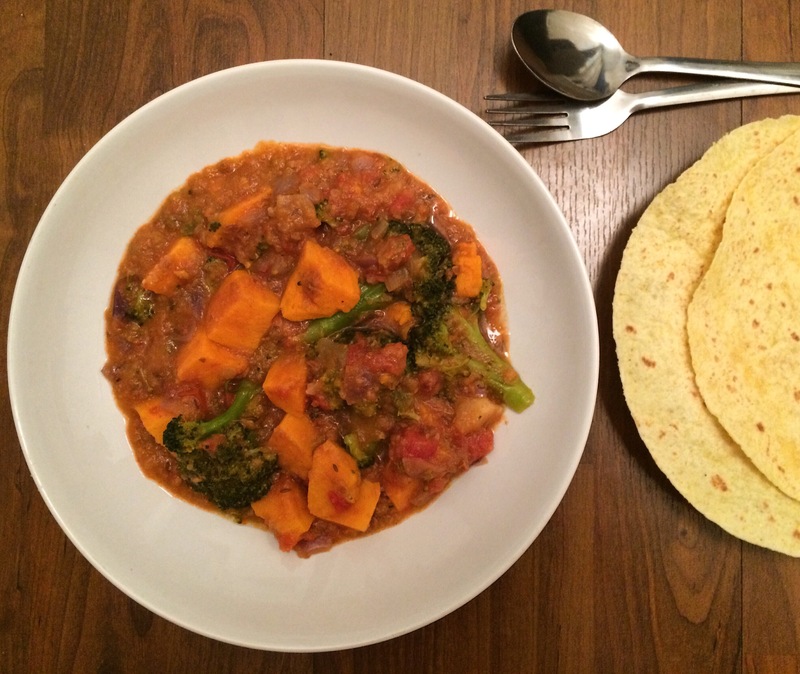 This recipe was inspired by BBC Good Food’s chard, sweet potato & peanut stew.